Banana bread is one of my all-time favorite dessert breads. The smell that fills up the kitchen reminds me of baking it during my childhood. So when I forgot to eat my bananas purchased for the week, it was a no-brainer of what I should do with them. I’ve been trying to nail this recipe for a few weeks now, and I think it’s finally just right. It’s light, yet filling, nutrient dense, and delicious. This recipe uses whole wheat flour, olive oil, and lower amounts of added sugar from maple syrup. A true keeper, this is not your average banana bread in the best way. When ‘healthifying’ a recipe, I suggest taking it slow and tweaking the ingredients a little bit each time. The easiest ingredients to change up are flour, sugar amounts (and type), and oil of choice. For instance, with this banana bread, I started with half white flour/ half whole wheat and eventually moved to wheat. Then I played around with decreasing the sugar content and oil (little by little) until I was happy with the nutritional content and taste. Having honest taste testers is also helpful when swapping ingredients! This is a great example of introducing healthy ingredient swaps and how small changes can add up. If adding banana topping: I like to spray the top of the bread with a mist of olive oil (using a Misto spray bottle) for optimal caramelizing of the bananas. The topping may add an extra 5 minutes or so onto cooking time. 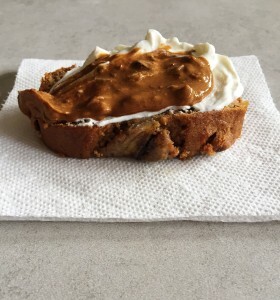 Serving tip, as seen on my Instagram account (@eats2know): Toast a slice of warm banana bread and top with plain Greek or Icelandic yogurt (ex: Siggis) + nut butter of choice. The next time you have brown spotty bananas go ahead and give this recipe a try. If you make this recipe, let me know how it turns out by commenting below or tagging me on Instagram! I made banana bread with olive oil last week, it keeps it so moist and yummy! I agree! The olive oil is a great healthy swap and keeps it moist. I can’t say how long it stays this way because it doesn’t last very long around here! I love using olive oil in bread. 🙂 It gives it a really rich, dense taste… Oh, and I’ve been using the Once Again nut butter you sent me. <3 SO GOOD!